From the South - On Bardstown Road, after crossing Eastern Parkway, turn left at the second traffic light and you will be in the parking lot of the Mall. From the North - If you are going south (away from downtown) on Bardstown Road, after crossing Grinstead Drive, turn right at the next traffic light into the parking lot entrance to the Mid-City Mall. Library services to the Highlands and Shelby Park neighborhoods date back 100 years, with two original libraries located separately in elegant Carnegie buildings. 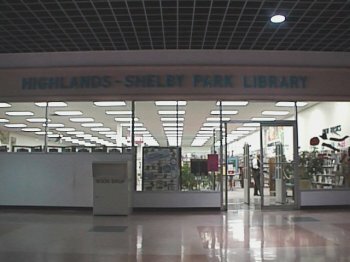 The collections were merged and moved to the Mid-City Mall in 1994, creating Highlands-Shelby Park Library. The Library has an extensive collection of audiobooks on CD and cassette, as well as a large selection of cookbooks. Highlands-Shelby Park Library continues to provide the excellent service of its two predecessors, while also offering the convenience of Mall shopping and abundant parking.